Previously featured in our Gift Guide for Beloved Book Lovers, we can’t resist Simon James’ mixture of pop culture (music, in particular [the good, dark, 70s and 80s stuff, even more in particular]) and literature (also the good, dark stuff). Check out our exclusive interview with him and, if you feel so inclined, go ahead and splurge on yourself with one of his incredible prints. You have several series of pieces that mix pop music, classic literature, and your own brand of wry humor. How did you first get the idea to swirl all of these ingredients together? The cultural things we each respond to the most sort of become our friends. We have our favourite books, our favourite films, our favourite albums and so on, and they can sustain us and remain with us unswervingly for our whole lives sometimes, just like friends. And my attitude has always been: I can indulge myself in these things’ greatness, sure, but it’s important to keep some perspective. And one of the ways we do this with our friends is to make little jokes about them, in their company, kind of for our own and for their amusement. It’s an acknowledgement that they’re great, yes, but ultimately we’re all limited, we’re all human. And this is my approach to my work, this is how and why I make my work, to celebrate the things I love, but also to give it a little dig in the ribs too. In practical terms, the work usually comes out of something serendipitous. Like when I looked sideways at a pile of Penguin books that were sitting on my desk while listening to The Smiths’ ‘The Queen Is Dead’. Morrissey’s lyrics on those Smiths albums were steeped in Kitchen Sink drama (a genre I love), with each song potentially being the germ of an Alan Sillitoe-esque novel or perhaps a John Osborne play. 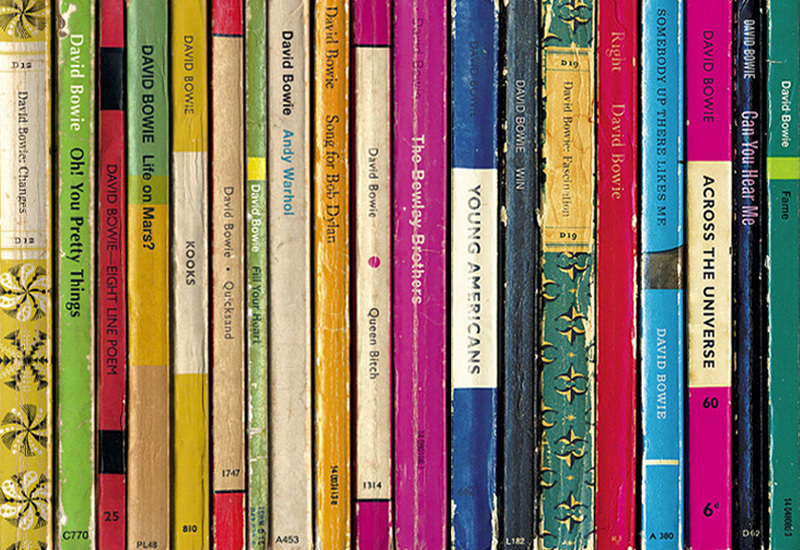 As I looked at the books I made a connection between songs and novels, and so the idea of reimagining an album as a series of books was born. This also brings up another strategy I’ve used a lot in my work, of putting one type of thing in another thing’s clothes. One of my favourite short stories is JG Ballard’s ‘The Assassination of John Fitzgerald Kennedy Considered as a Downhill Motor Race’ – so sacrilegious! And this is of course based on Alfred Jarry’s equally sacrilegious ’The Passion Considered as an Uphill Bicycle Race’. This approach sort of tests the usefulness of both things in a wider context, plus the juxtapositions it allows can generate humour… or possibly bafflement, its distant cousin. Many of your pieces are inspired from Penguin Classics and paperbacks of old. Why did you choose this aesthetic? Ah well, I’ve loved the classic tri-band Penguins since seeing them on my grandparents’ bookshelves as a child. They’re so economical, so matter of fact and functional, and I’m always drawn to art and design that has some kind of practicality or functionality to it or that at least engages with that as a possible subject for art. And it’s their plainness, their ordinariness, that appeals too. The fact that these things were mass-produced in their tens or hundreds of thousands, that they were just things that people bought cheaply, read, then bought another one the following week… there’s something utopian in that, I think, and so maybe that’s another appealing factor for me—they suggest exactly the kind of engaged, considerate cultural world I would love to live in myself. The Swiss International Style of poster design presses similar buttons for me. What was your favorite book as a kid? What was the first album you bought? I can’t remember having one particular favourite book when I was a kid, but I was a big Tintin fan generally. There’s another example of a highly functional aesthetic. Hergé’s line, his visual language, I feel, is so simple but is articulate enough to be able to depict anything. The first album I bought I think was ‘Zenyatta Mondatta’ by The Police. The inner sleeve had a great photo-collage, I remember. And ‘Bombs Away’ at the end of Side 1 remains one of my favourite ever songs (I could listen to Stewart Copeland’s drumming, in its infinite variation, forever. Or at least for however long it takes an album to play out). You hail from across the pond, and some of your art focuses on intrinsically British staples of culture, from Harold Pinter to the legendary Hippodrome and of course, the Tube. How do you find your non-Anglo customers relate to British culture, and what do you think in particular of America’s storied obsession with all things Dear Old Blighty? Yes, a large proportion of my customers are from outside the UK, so I guess my work’s cultural reference points must translate pretty well. Maybe it’s that similar-but-different thing, with there being enough fundamental similarities between one person’s experience in one culture and another’s in another that these things aren’t entirely alien, but they are pleasingly different or distinct… maybe it’s a combination of familiar and different that works for people. And as for America’s obsession with British things, well… you’ve just got good taste, haven’t you! Who’s another artist or emerging voice online who you think we should glom onto? Oliver Woods makes some very nice, subtle photos about what it’s like to live in contemporary London, as well as some further-flung places around the world. Katy Moran is an abstract painter whose visual vocabulary is subtle, playful and utterly joyful. Catherine Anne Daves is a recording artist and multi-instrumentalist whose debut album ‘Confessions of a Romance Novelist’, out in January, is a tour de force of musical dexterity shot through with a great literary sensibility. I was thrilled to be asked to design some of the cover art and merchandise for the album.